The INREV Guidelines are designed for non-listed real estate vehicles for institutional investors. Since non-listed vehicles can differ considerably, INREV provides a modular approach to guide investors and managers in agreeing on an appropriate level of adoption of INREV best practices and in deciding on the level of compliance with INREV requirements for individual modules. INREV’s best practice frameworks developed for the modules of corporate governance, liquidity and property valuation, are qualitative in nature and individual vehicles will adopt them in different ways. INREV’s objective is to ensure that investors are provided with a clear and accurate description of the corporate governance, liquidity and property valuation frameworks of a given non-listed vehicle. The INREV Guidelines Assessments have been developed to assess the compliance with these modules for managers as well as for investors. The assessment for the property valuation module will be added soon. In contrast to best practices, INREV’s requirements in the modules covering reporting, including sustainability reporting, performance measurement, INREV NAV, fee and expense metrics and INREV data delivery, are more technical in nature. These requirements leave no room for different interpretation: the requirements are either followed, or not. In addition, in the Reporting module, Performance Measurement module and Fee and expense module, some of the INREV Guidelines are recommendations rather than requirements. Although INREV would encourage members to follow such recommendations, they are not required to be followed in order to claim full compliance with the INREV reporting module. 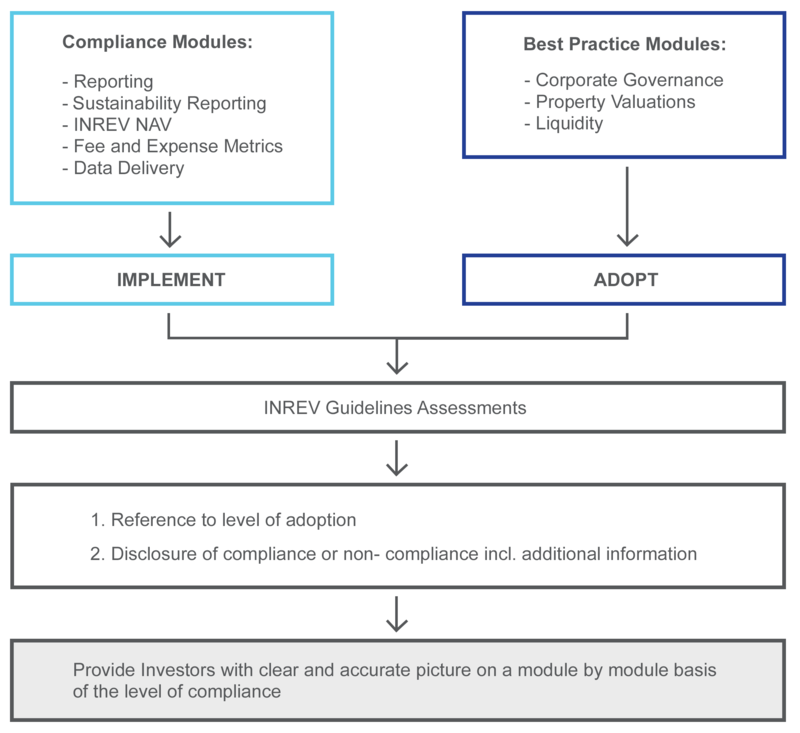 The INREV Guidelines Assessments include questionnaires to measure compliance with the Reporting module, the Sustainability reporting module, INREV NAV module and Fees and expense metrics module. The assessment for the Performance measurement module will be added soon. The level of compliance can be assessed with the help of the INREV Guidelines Assessments. The online assessments include all the requirements that need to be followed to be in compliance with the guidelines, as well as providing an overview of the applicable recommendations. If all of the requirements for an individual module are fully implemented, the manager can disclose full compliance with the relevant module. If the requirements of a module are not fully met, the manager should disclose that the vehicle does not fully comply with that module of the INREV Guidelines and state the reasons for deviation including any additional information relevant to investors. In all cases, investment managers should present investors with a clear and accurate picture of the level of compliance with the INREV Guidelines. The vehicle documentation should describe, on a module by module basis, the extent to which the vehicle aims to be in compliance with INREV Guidelines. The level of adoption and compliance with the INREV Guidelines is a matter to be discussed during the launch process of the vehicle. INREV does not provide any assurance on the degree of adoption of best practices or on the level of compliance with requirements for individual vehicles. The legal framework applicable to individual vehicles may require third party assurance on elements of compliance with INREV Guidelines, for instance where the legal NAV of the vehicle is the INREV NAV. We recommend that investors and managers discuss and agree the nature of such assurance as part of the launch process. The INREV adoption and compliance framework is summarised below. The framework includes references to tools which can be used to assist in the application of the guidelines. Managers should make disclosure corresponding to all relevant INREV reporting requirements and recommendations as a component of their annual or interim reports to investors. Managers should evaluate the level of compliance with INREV requirements and recommendations, using the Reporting Guidelines Assessment. Managers should include all information corresponding to applicable INREV reporting requirements and recommendations in their annual and interim reports. Management and non-executive officers should review the adequacy of the compliance disclosure to investors summarising the level of compliance with reporting requirements. Auditors could give negative assurance on the degree to which INREV reporting requirements and recommendations are complied with. Managers should make disclosure corresponding to all relevant INREV sustainability reporting requirements and recommendations as a component of their annual or interim reports to investors. Managers should evaluate the level of compliance with INREV requirements and recommendations, using the Sustainability Reporting Guidelines Assessment. Managers should include all information corresponding to applicable INREV sustainability reporting requirements and recommendations in their annual and interim reports. Management and non-executive officers should review the adequacy of the compliance disclosure to investors summarising the level of compliance with sustainability reporting requirements. Auditors could give negative assurance on the degree to which INREV sustainability reporting requirements and recommendations are complied with. Managers should disclose all relevant INREV performance measures in accordance with performance measurement requirements. Managers should evaluate the level of compliance with INREV requirements and recommendations. Managers should include all information corresponding to applicable INREV performance measurement requirements and recommendations in their annual and interim reports. Management and non-executive officers should review the adequacy of the compliance disclosure to investors summarising the level of compliance with performance measurement requirements. Auditors could give negative assurance on the degree to which INREV performance measurement requirements and recommendations are complied with. Managers should calculate and disclose an INREV NAV in accordance with INREV requirements. Managers should evaluate the level of compliance with INREV NAV requirements, using the INREV NAV Guidelines Assessment. Managers should include the INREV NAV in their annual and interim reports along with required disclosures. Vehicle documentation should include the required information. Management and non-executive officers should review the basis and adequacy of disclosure to investors summarising the level of compliance with INREV NAV requirements. Depending on circumstances, auditors can give assurance or negative assurance on the INREV NAV and level of compliance with related disclosure requirements. Managers should calculate and disclose fee and expense metrics in accordance with fee and expense metrics requirements. Managers should evaluate the level of compliance with INREV fee and expense metrics requirements using the INREV Fee and Expense Metrics Guidelines Assessment. Managers should include information corresponding to INREV fee and expense metrics requirements in their annual reports and in the vehicle documentation. Management and non-executive officers should review the basis and adequacy of disclosure to investors summarising the level of compliance with fee and expense metrics requirements. Auditors could give negative assurance on the level of compliance with fee and expense metrics requirements. Managers should provide information to INREV in accordance with INREV data delivery requirements. Managers should evaluate the level of compliance with INREV data delivery requirements. Managers should provide INREV with all relevant information corresponding to INREV data delivery requirements. Management and non-executive officers should review the basis and appropriateness of the compliance with INREV data delivery requirement disclosure to INREV.